South Point Hawaii (also known as Ka Lae) is the somewhat out of the way but remarkable place that is famous for being the southernmost point in the United States (nope, it's not Key West). South Point Hawaii is a fantastic place to get away from more crowded areas of the Big Island and experience the vast beauty and power of the ocean. 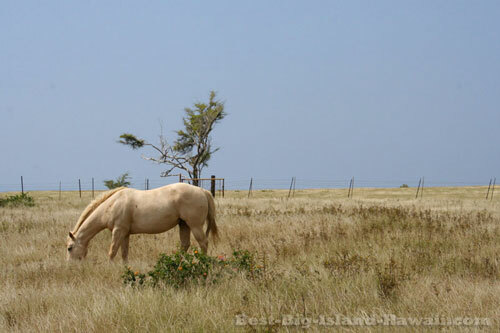 It's well worth the trip and makes a good detour on the way to the Hawaii Volcanoes National Park or a day trip of its own including a hike to Mahana Bay and its Green Sand Beach. Access is via South Point Road, which is a right turn off of Highway 11 between mile markers 69 and 70 if you're coming from the Kona side. 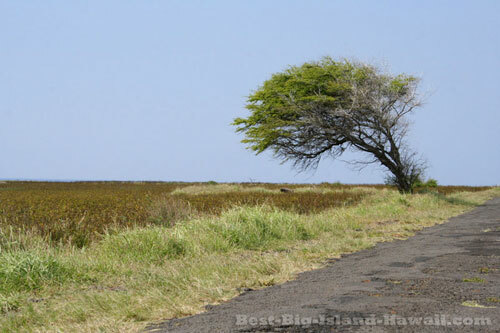 It's about 50 miles (an hour and a half drive) from downtown Kailua-Kona. The road is paved but narrow, so drive carefully. You might want to check with your rental car company to see if you're technically allowed to drive on South Point Road. In any case, its not a 4 Wheel Drive road so there's little chance of getting stuck. But do be aware of the restrictions of your policy. The road heads south from Highway 11 and along the way you'll see remnants of an old Air Force station, a wind farm, wind blown trees and maybe some horses grazing. After 10 miles, the road forks. Stay to the right to arrive at the cliffs and the southernmost point. The actual southernmost point is a few hundred yards further south than where the road ends, just past a tall metal beacon. Following the road to the left at the fork will take you to an unofficial "visitor's center" where you might be asked by some locals to pay a parking fee. Pay if you want but know that, officially speaking, parking here is free. The end of this part of the road is a good place to park if you're going to be hiking to Green Sand Beach or Kaalualu Bay rather than the cliffs and southernmost point. For thrill seekers, South Point Hawaii is a great spot for cliff jumping—but only when the conditions are right! The waters around South Point are a remarkable demonstration of the ocean's power. Strong currents nearby were the downfall of ancient paddlers who got into the wrong waters. Also, strong winds from the east consistently make the waters rough. Basically, the area to the east of the point is almost always rough and unsuitable for swimming. 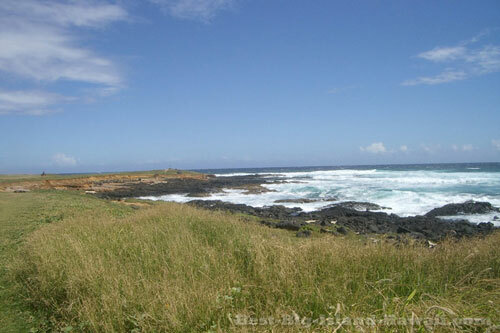 The area to the west of the point is protected from the wind, so cliff jumpers and snorkelers love this area. 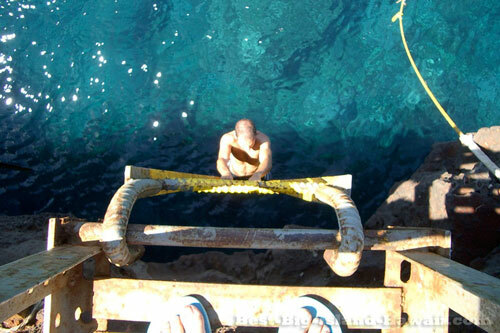 The deep blue waters just below the cliffs are accessible because of the ladders connected to the old boat hoists. These reach up from the surface to the top of the cliffs and make exiting the water possible after jumping in for a thrill or to explore the sea life below with a mask and snorkel. 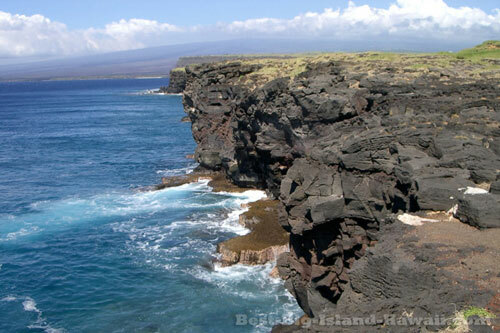 Of course, if you're looking for good snorkeling, you need not brave these waters around South Point—there are plenty of other Big Island snorkel spots that don't require a 40 foot leap. On calm days, jumping in and getting back out safely is possible. The area immediately below the cliffs is not really affected by the strong currents further out because of the protected location on the west side of the point. On days when the surf is up, stay out of the water and enjoy the view from the top of the cliffs. Swimming in the waters below the cliffs is always a thrill because, let's face it, you're treading in deep uncertain waters at the bottom of a tall cliff in an area barely sheltered from powerful winds, surf and currents that threaten to either smash you against the rocks or carry you to Antarctica. If this doesn't phase you, you must have ice water running through your veins like Laird Hamilton. Know that, in the right conditions, jumping from the cliffs can be done safely but always err on the side of caution and proceed at your own risk. 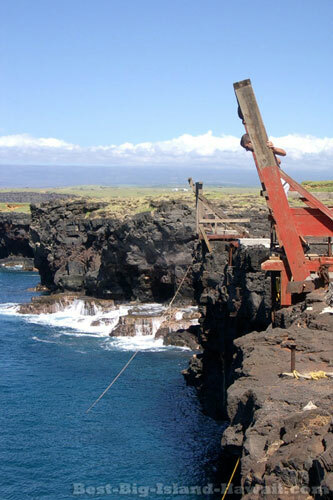 Whether you go for the thrill of a cliff jump, the right to say you've stood on the southernmost piece of land in the United States, or just to enjoy the breathtaking view from the end of the world, South Point Hawaii is a worthwhile destination on the Big Island and an unforgettable memory.